In the same vein as “too many cooks spoil the broth”, “too many meetings spoil a company”. Not literally of course, well we hope not, but for some reasons there seems to a meeting for everything from which cups to use in the coffee machine to latest, marketing campaign. Then there are the meetings to discuss the last meeting, and a meeting about that one and so on and so forth. This must be how it works as every time you try to get hold of somebody in authority their secretary politely informs you that they are in a meeting.....If there is always some kind of meeting going on in your place of work and it has become somewhat of a standing joke then these Meeting Madness corporate ecards will go down a storm with your colleagues. There are images of faceless people sitting in a meeting and one guy is standing up and is looking out towards us, gesturing to indicate he is speaking. The legend reads “We will continue having lots of meetings until we find out why no work is being done”. 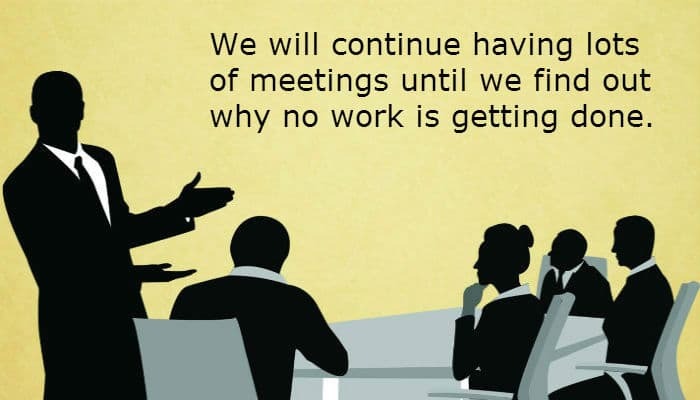 These simple little ecards perfectly sum up corporate mentality regarding meetings and your colleagues will love this landing in their inbox. If you have 2 minutes to spare why not see how your business can wow your clients this Christmas time with our amazing e Christmas cards for business.